If you’re a parent, you’ve likely had to deal with your offspring developing an ear infection at one point or another. It starts with the kid complaining of ear pain, maybe dizziness, maybe gross discharge, and usually ends with a trained medical professional jamming a pointy light into your child’s ear, examining the aural canal for a few moments, then dictating which brand of drops you’ll spend the next week pouring into your son or daughter’s squirming, complaining head. Every parent goes through it at some point, and the experience is no fun for anyone involved. Fortunately, a mobile microscope company known as CellScope has created a smartphone attachment that takes the hassle out of the entire process by allowing parents to perform the most complicated part of the diagnosis procedure at home. 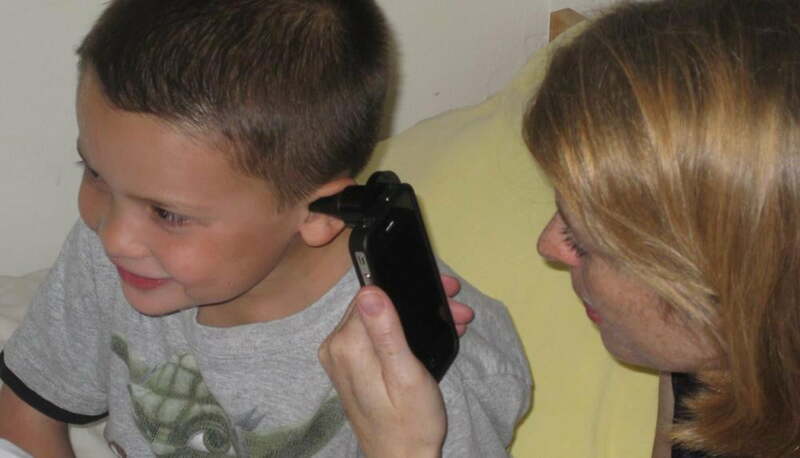 The peripheral essentially adds an otoscope to your smartphone’s camera, turning your device into a makeshift medical instrument that can be used to capture images from within your child’s ear canal. From there it’s a simple matter of sending the imagery off to your doctor who can quickly diagnose the problem based on the pictures you’ve captured. Doctors quoted by CellScope claim to appreciate that the device allows for the creation of a high-definition image-based record of a child’s ailments that can easily be added to his or her ongoing medical record, while insurance companies appreciate the otoscope as it saves them from having to shell out cash for parents needlessly rushing their kids to the ER at the first sign of an ear ache. Though CellScope originally grew out of the microscopy lab at the University of California Berkeley with the goal of creating cheap 60x microscopes that could be used in impoverished parts of the world by both volunteer aid workers and the indigenous population, this latest gadget is being designed with the consumer space in mind. As VentureBeat points out, CellScope believes that its smartphone otoscope could “save around 30 million pediatric doctor appointments each year that result from ear infections and ear aches” — a figure that, combined with the ubiquity of modern smartphones, could make this otoscope a must-have household item for anyone with kids. CellScope has announced that it managed to raise $1 million in seed funding from Khosla Ventures to build the otoscope, and the firm is currently testing prototypes of the device in California. So far there is no word on when the otoscope will be available to the public, but barring major catastrophe it shouldn’t be too far off.